Arnold went peacefully into the hands of the Lord November 14, 2018 at the age of 84. 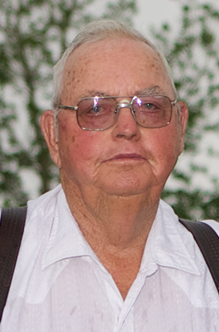 Arnold was born January 4, 1934 in Claresholm and grew up on the family farm. He loved his family, friends and the outdoors. He worked countless hours farming and raising cattle; in 1982 he became a Real Estate Broker and owner of Homestead Realty Ltd. He was Past President of the Alberta Murray Grey Association, Secretary Treasurer of the Claresholm Fish & Game Association, President of the Claresholm Trap Club, a member of the Amateur Trap Shooting Association and Stavely Elks. He loved calf roping and team roping in his younger years as well as hunting and trap shooting throughout his life - not to mention poker games and gatherings with friends and family. Arnold was full of stories and laughs and could fix anything. He was predeceased by the love of his life, wife Myrtle Norgard (nee Johnson) along with his parents Karen Norgard (nee Thompson) and Louis Norgard; siblings Clarence Norgard, Margaret McGuire, Jim Norgard and Grace Norgard. Arnold is survived by and will be greatly missed by his brother Ellis Norgard; daughter Lorraine and son Allan (Debbe); grandchildren Lorinda Turner (Clint) and great-grandchildren Emma, Cameron and Maddox; Mallory Aube (Ian) and great-granddaughter Brooke; and Jeremy Norgard (Cass) and great-granddaughter Hallie; Michaela Pacultad (Mark) and great-grandson Mhykoh; along with numerous family members and friends. A Celebration of Arnold’s Life will take place at the Claresholm Community Centre (5920-8th Street West, Claresholm) on Thursday, November 22, 2018 at 2:00 pm. In lieu of flowers, donations may be made to the Claresholm Ag Society, P.O. Box 1401, Claresholm, AB T0L 0T0.